FACT CHECK: Can a Person Live Off of a Diet of Potatoes and Butter? People could "survive" eating a very limited diet, health experts told us, but they wouldn't get everything their bodies needs to function. 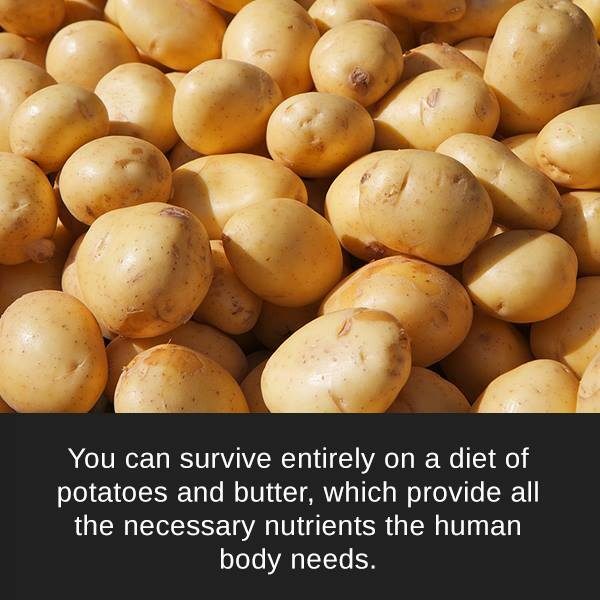 A person can "survive" living on a diet of nothing but potatoes and butter. Eating nothing but potatoes and butter, in sufficient quantities, could keep a person alive for an indeterminate period of time. Whether a person could remain healthy in the long term on such a dietary regimen would depend upon on other health factors. The idea that potatoes can be a catch-all form of sustenance for human beings has been popularized at various times by public campaigns and movies, but health experts are split on the potential impact of “surviving” on just one type of food. There’s a big difference between what your body needs to survive and what your body needs to work as best as it possibly can — to be as efficient, to be as healthy, to be as strong and it possibly can. There’s a big difference between that and merely surviving. If you were hard-pressed and you had to do it, you could absolutely survive on it. Is it nutritious? Is it healthy and balanced? Absolutely not. Dana Hunnes, senior dietitian at Ronald Reagan UCLA Medical Center, disagreed slightly. She told us that this type of diet could be sustainable for persons who consumed enough potatoes to support their body weight and muscle mass. However, she said she would advise anyone looking to pursue that kind of regimen to instead eat a wider variety of fruits and vegetables. At least two public campaigns have touted the supposed merits of an all-potato diet. In 2010 Chris Voigt, head of the Washington State Potato Commission, promoted the merits of tubers by living off of them for two months. Voigt lost 23 pounds during that experience and denied rumors that he had abandoned his plan early. That type of short-term effort, Basbaum said, was unlikely to cause a person much damage provided that they not only had a clean bill of health but also no family history or risk of heart or kidney disease. Butter, she told us, is extremely high in saturated fats and can lead to unhealthy cholesterol levels. “If somebody came in here saying, ‘I heard about this potato and butter diet,’ I would tell them not to touch it with a 10-foot pole,” she said. Similarly, potatoes on their own are rich in potassium but are best enjoyed in moderation because of the threat they pose to the kidneys, which manage potassium intake for the body. Six years after Voigt’s efforts, an Australian man, Andrew Taylor, also made news when he announced that he lost 114 pounds after spending the year eating around eight or nine pounds of potatoes per day on a “spud fit” diet. Taylor posted before-and-after pictures touting his weight loss, but Basbaum did not interpret the results as being fully positive. Heavily-restricted diets gain popularity, Hunnes told us, because some people are seeking “the magic bullet” to keep them healthy. For her part, Basbaum said that restricting oneself to that extent gives some dieters a feeling of control because it limits their margin of error. In popular culture, the popular novel The Martian (which was adapted into a 2015 feature film) featured a subplot in which stranded astronaut Mark Watney grew potatoes on the surface of Mars and ate them to keep himself alive. 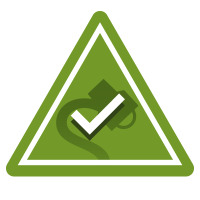 Subsequent research by the International Potato Center (CIP) in Peru produced “encouraging results” regarding the prospect of growing potato crops on the red planet. “With this study, we have the basis for contributing to the so-called ‘Bioregenerative Food System’ proposed by space agencies, based on a space agriculture using local resources — such as soil — in future missions to Mars,” lead researcher David Ramirez said at the time. The Today Show. 19 December 2016. CBS News. 30 November 2010.